To start off, we should probably establish that Paulson Jallock is not actually a game. As such, it's not the easiest thing to review. I mean, really; you can't analyze gameplay or story when those things don't exist. But the general principle - looking at what something attempts to do, and analyzing how well it does that and maybe how good an idea it was in the first place - works just fine, and in this respect you have before you a pretty successful program. Basically, Paulson Jallock is a procedural image generation program which, as the name might suggest and as the author states, "allows your computer to be an abstract artist." 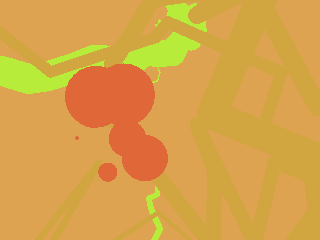 This manifests itself in the drawing of a lot of random splotches and lines in randomized colors. The author also says that "there's not much else to say about it," which is true, and he also says that "it's gorgeous sometimes," which is also true, and which is why I'm writing this review. Predictably, some of the patterns are ugly, but some of them are also genuinely pretty, and it lets you save them, which is nice. There isn't much to say about some things, but they might still be worth experiencing, and this program is a thing like that. I wish the author had expanded on the concept - allowed user parameters, and perhaps even turned it into a screensaver - but as it is, it's interesting enough to be worth a look, or five. If it's late at night and you've got nothing to do, you might even enjoy staring at it; I won't judge. Press space if you want to end image generation and make a new one, by the way. Nobody has added Paulson Jallock as a favorite game yet. Be the first. Sure, it looks nice, but it's not even enough of a program to last more than a minute or two. You turn it on, look at if for a few seconds, then quit. It's almost as if you were showing us a concept rather than giving us a program. A fair game. It has its problems, but a few merits, too. Could use polish. Try it if you have nothing else to do. Wow, I completely forgot about this. Come to think of it, if I can dig up the old .gmk, maybe I will add those things. Thanks for featuring it, Jabby. This is pretty interesting. You should add some user-defined parameters and make it a screensaver.